The overwhelming majority of statistical analyses of occupational cohort data are conducted in terms of the standardized mortality ratio or SMR. 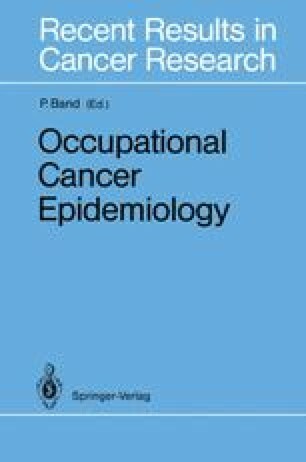 Saracci and Johnson (1987) reviewed 55 cancer epidemiology papers published during 1982 in the American Journal of Epidemiology, the British Journal of Industrial Medicine and the Journal of Occupational Medicine. All but one of 20 occupational cohort studies that they identified employed the SMR as the principal method of analysis. In spite of its evident popularity, the SMR is particularly susceptible to the selection and confounding biases that affect observational studies generally (Hill 1953; Cochran 1983) and its uncritical use as a summary measure has received frequent criticism (e.g., Gaffey 1976). The continuing debate regarding the relative advantages of local vs national rates as a basis for comparison (Gardner 1986) is a reminder that many other factors besides membership in a particular occupational cohort affect disease rates. “Background” variation in SMRs computed for cohorts in different geographic areas can be expected to swamp the Poisson sampling variability that is reflected in the usual measures of statistical uncertainty. Paper prepared for the International Symposium on Occupational Cancer Epidemiology, Vancouver B.C., 13–13 June 1988. Supported in part by USPHS grant CA40644.